Express your love for your sweetheart by buying incredible Valentine Gifts for him and getting them delivered to his doorstep online with MyFlowerApp. Select his favorite perfumes, cakes, chocolates, personalized gifts, and more and we will deliver them for you. This Valentine’s Day, let your love know that he is your 3 am thoughts, your heart’s epic adventure, and that he is ‘The One’ for you, now and forever. Make things slightly different this time around, and buy Valentine Gifts for Him instead of only receiving them, this Valentine’s Day 2019. Send him romantic gifts online, or surprise him with a midnight delivery of his favorite cake and flowers, or plan an elaborate date night for you both, and amaze him for a change. Women are always more vocal about their love, while men like to express their emotions via their actions. Turn the tables on them, and this time express your love through some sweet gestures that will astound him. Go to MyFlowerApp’s website and peruse through our extensive selection for amazing gifts, chocolates, flowers, cakes, and combos to send to your significant other, on this day of love. The key to a man’s heart is through his stomach. So for your chocolate-lover, send him his favorite chocolates in bouquets, Chocolate baskets, Ferrero Rocher Tree, and other assorted savories. Or if he has a sweet-tooth, peruse through our Valentine Cakes and order his favorite. Get them delivered to his doorstep anytime, and begin Valentine’s Day with a sugary celebration. To make the little date extra cute, get their favorite flavor in heart-shape cakes or photo cakes with your pictures on it. Simply order online with MyFlowerApp, and with our express delivery service, we will ship it anywhere in India, within 3 hours. Valentine's Day is a long-awaited day for couples, especially those who rarely get time together. Make this day even better for you, by sending personalized Valentine Gifts for your husband or boyfriend, with the help of MyFlowerApp. Use pictures of your special moments and beautiful memories, and get them printed on one of our various products like cushions, key rings, photo frames, mugs, and even cakes. Or, you can get your names, or some special message printed on these. If you are unsure of what message to get inscribed on these, you can peruse through MyFlowerApp’s website and select something from its assorted selection. Maybe you can get a mug with your wedding date and your names on it. Not only will he love the gift for its warm import, but he will not forget your anniversary next time either. Likewise, you can surprise him with a photo frame of his name, or decorate your house with pictures of both of you, and touch his heart with your love. 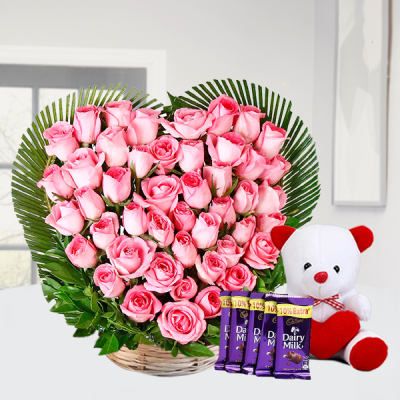 If your relationship is still relatively new, and you are not sure of what to get him, simply get him one of our romantic Flowers n chocolate combos. They are the best failsafe in any situation. Your husband always plans such great surprises for your birthdays, anniversaries, and Valentine's Day. He makes you fall for him, every day. Let us help you do the same for him, this year. Make this year different by buying Valentine’s Day Gifts for your Husband this year before he gets you anything, and surprising him with some quality time together. Some of the best Valentine Gifts for Husband would be perfume or a personalized gift with some significance to it. However, he will value your efforts way more than any gifts you get him, so make these attempts count. Plan a date for both of you, get his favorite heart-shaped cake delivered home, along with some romantic red roses. Or if he is a night owl, get a midnight delivery of his favorite chocolates and a useful gift, or a Flowers n chocolate combo like Ferrero Rocher Roses Bunch or Rose Heart Full of Chocolate. You can get him something like a heart-shaped key ring with your pictures on it, so that every time he goes out, you are still on his mind. If he likes lounging on the bed or sofa while surfing the web, get him a personalized cushion or an apron if he has magic fingers. When you make even the slightest effort, he will be telling you he has fallen for you again, by the end of the night. After all, a successful marriage requires falling in love many times, always with the same person. Are you missing your boyfriend, who is, unfortunately, far from you? Absence is to love what wind is to fire; it extinguishes the small and inflames the great. So, how about this? This Valentine's Day 2019, let him know how much you miss him, and show your love for him, by sending over something he loves or would love. 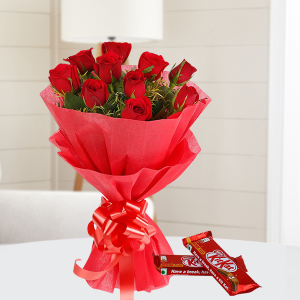 With MyFlowerApp, you can get Valentine Gifts for your Boyfriend delivered anywhere in India within 3 hours with free shipping. Send gorgeous flowers to aromatize his life with your love, and add chocolates, cakes, or personalized gifts of his preference to the mix. Buy fresh, handpicked flowers and flower arrangements in elegantly alluring designs, set by expert florists and artisans, or get him scrumptious cakes in gorgeous designs and his favorite flavor. If you want both, then send both - a Flowers n Cake combo. Get him gifts that he will love - something that suits his personality and likes. MAybe get him a coffee mug with personalized, funky messages like ‘Soul Mate’, ‘King’, ‘Prescription Coffee’ or if it is beer, that he prefers, get him personalized ‘Photo Beer Mugs’ or ‘Great Minds Drink Alike Beer Mug’. Simply go through our extensive range and select whatever you like for him, and send them to your love anywhere around the globe. Couples are going above and beyond celebrating Valentine's Day. Valentine Week is the trending celebration, nowadays. If you wish to make this week more special for your Significant Other, you can get them MyFlowerApp’s Valentine Serenades. Get splendid combos including flowers, cakes, chocolates, teddy bears, and more. Get them for anywhere between two to seven days. Simply select a starting date, and the serenades will continue until however long you want. Cover each day of Valentine's Week with gorgeous combos and instantiate your love by making a grand and romantic gesture of serenading your girl, literally. Cannot sing? We are here to help! Simply book our ‘Rhythm of Flower’ and a proficient guitarist will be there, giving your romantic moments – tender background music. If you are far from your love, you can select this option, and give your emotions, words with our help. One person will deliver your flowers to your love, and another will sing your requested song letting him know how much you love him. Simply request your or their favorite song, to be the means of expression of your love, and our guy will reach the destination and help you woo your guy, in a way that is straight out of the movies. Whether your darling lives with you, in any other city in India or the seas and oceans, are the ones separating you – MyFlowerApp will come through for you on the day of love and deliver your affection to them, anywhere in India or overseas. With our express, same day, and midnight delivery services, we will deliver your package in the utmost pristine condition. All our blooms are garden fresh, professionally picked, and arranged, our cakes just out, and all our gifts immaculately packed. We cater to major cities like Delhi, Bangalore, Chennai, Gurgaon, Hyderabad, Kolkata, Mumbai, and Pune and hundreds of other smaller cities and towns as well. You can also send your love abroad, to countries like Australia, Canada, France, Germany, Malaysia, Singapore, South Africa, Sweden, UAE, UK, US, and more. We will help you ship your love anywhere you want. We are here for you, with delivery around the globe, on time.